Welcome to your go-to guide for selecting the best blood pressure monitor to suit your health needs (and budget!). Whether you are looking for a conventional upper arm monitor with a blood pressure cuff to use on a daily basis at home or you need to quickly acquire a portable model to accompany you on your next business trip, you have come to the right place! The goal of this website is to help YOU to pick the best BP monitor amongst the hundreds of options available today. Buying (and using) one of these is the first step to avoiding or reversing hypertension. We provide you with in-depth blood pressure monitor reviews to help you navigate the vast online marketplace before making a well-informed purchase decision with your hard-earned dollars. Also, we have compiled a list of useful resources and have written informational articles you will want to visit in order to learn more about high blood pressure, how to take blood pressure at home and anything related to blood pressure monitors. The most budget-friendly monitors will cost you less than $50 while mid-range models with more features come in under $100. High-end monitors, which exhibit the newest technology and advanced features, have price tags greater than $100 but are still less than $150. 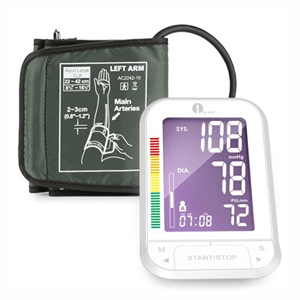 There are many ​monitor types available in today’s market such as blood pressure monitors for your finge﻿r, wrist, and upper arm. You need to also decide if you prefer a modern automatic, oscillometric digital blood pressure monitor or if you have your heart set on acquiring an old-school manual sphygmomanometer like what your doctor uses. We recommend automatic blood pressure monitors, which are what you will generally find sold on Amazon. Now for the fun part! Once you have a price range in mind and a good idea of what type of blood pressure machine you want, head down to our comparison table of the top models to decide which of the best BP monitors matches your budget and style preferences. You can even browse through different styles of monitors from what you initially selected in case you have a change of heart (pun intended). If you have stumbled upon this site from Google, the odds are high that you are one of the 78 million American adults with hypertension (aka high blood pressure) or one of the 30 million Americans with diabetes. While you can lower your blood pressure by losing weight, eating healthier, receiving preve﻿ntative care, and living a more active lifestyle, the first step is to actually know what your blood pressure level really is. Regardless of your age, weight, or overall health, the one thing that will benefit everyone is to purchase a reliable, accurate blood pressure monitor. Typically, these devices are the most beneficial for seniors, diabetics, pregnant women, and anyone taking medication to control blood pressure. This is a very important step and can be overwhelming at first. However, as you will learn, buying a blood pressure monitor is not rocket science (thank goodness!) and the process of buying the right one for you and your family should not be as complicated as shopping for a new car. This guide will tell you anything and everything you need to know about buying the best blood pressure monitor to suit your needs such as which ones are the most comfortable and which machines make the least noise during operation. One in every three Americans is said to be plagued by hypertension. Despite this, the vast majority of us give little, if any, thought to our blood pressure measurement levels. While this probably doesn’t seem like such a big deal at first glance, undetected high blood pressure can have disastrous results. Many who suffer from high blood pressure visit their doctor on a weekly, bi-weekly, or monthly basis to have their blood pressure taken and ensure everything is running smoothly. While consulting a medical professional is certainly the number one way to stay on top of things, it is advisable to purchase the best home blood pressure monitor so you can keep track of your BP and heart rate every day. Of course, finding the right blood pressure monitor for you might be a little tricky. There are literally hundreds of thousands of them on the market, but only a very small percentage of them can offer reliable blood pressure readings. In this article, we’re going to be looking at the top blood pressure monitors and the brands which manufacture them. The aim being to point you in the direction of some of the top blood pressure monitors so you don’t waste your time - and money - on inferior products. 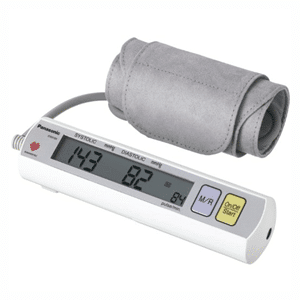 A blood pressure monitor is an apparatus used to measure a user's blood pressure. Typically, they are used on the upper arm or wrist (though finger monitors are also available). The measurement is shown to the user to be recorded and used as a way to help manage hypertension or irregular heartbeats. These machines provide an easy and convenient way to keep an eye on your health metrics at home between doctor visits. If you have done any research on blood pressure monitors in the past, you likely already know that there are a couple of different types available. For the old fashioned, we've also made a review on the best sphygmomanometers for you. While it is certainly nice to have a couple of options to choose from, it can become a little overwhelming when trying to figure out which is the best type of blood pressure monitor for you. We recommend getting an automatic, upper arm monitor for your home for the best and most consistent results. 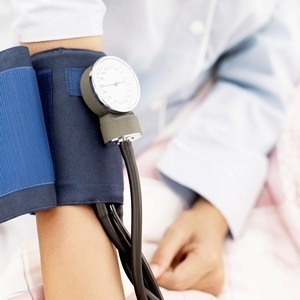 Before we delve into blood pressure monitor brands and the specific devices which they produce, we’re going to take a moment to discuss the different strains of blood pressure machines. Choosing the right one for you can mean the difference between being constantly plagued from hypertension or finally overcoming it! This is what most people think of when they imagine a blood pressure monitor. Upper arm blood pressure monitors always feature a cuff which - as you might have guessed - wraps around the top of the arm in order to read the wearer’s blood pressure. This is perhaps the most reliable way of attaining an accurate estimation of one’s blood pressure, providing you get your hands (or arms) on a decent model. Wrist BP monitors are an extremely popular method of monitoring one’s blood pressure and are generally seen as the best option for somebody who is traveling a lot and needs to keep their luggage to a minimum. While there are those who believe you can only get an accurate estimation of your blood pressure by using an upper arm cuff, a good wrist blood pressure monitor beats a poor arm device any day of the week. If you purchase them from a reputable brand, you can be sure of reliable BP readings for years to come. To sweeten the deal, this kind of monitor tends to come in at a little less than its upper arm counterparts...so if you’re trying to save a little bit of money while getting a great result, a wrist monitor is the way to go. Similar to the wrist monitors described above, finger blood pressure monitors get a lot of flack. However, the criticism of this kind of monitor is arguably more justified than it is for its wrist counterpart. While there are a few finger blood pressure monitors out there that are thoroughly impressive, the vast majority of them are inaccurate. But I don’t want to be too negative or turn you off of finger blood pressure monitors completely. If you get a good one and use it properly, you’ll have little to worry about. A quality finger blood pressure monitor, when used correctly, will give you timely readings and sufficient accuracy. Choosing the kind of blood pressure monitor you want is only a third of the battle. Once you decide which is the best kind of device for you, you have to commit to a particular brand and then choose one of their monitors. 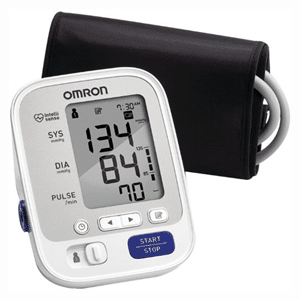 When discussing the top manufacturers of blood pressure monitors in the world, it would be remiss to not mention Omron. Omron, as you may already know, is the number one brand of doctor blood pressure monitor in the world. Its products are recommended by medical professionals all across the globe, meaning you can be sure of an accurate and reliable estimation of your BP regardless of which Omron product you purchase. They also have engineered the most comfortable arm cuffs on the market. There is a downside to Omron, however. Because of the brand’s immense success and the goodwill attached to the name, its monitors tend to go for a little bit higher than most other blood pressure monitors. Obviously, this doesn’t mean you should totally avoid Omron blood pressure monitors, but it is something to be mindful of if you are trying to keep costs down. In St. Louis, the land of arches and RKOs from out of nowhere, there is a company by the name of Greater Goods. Greater Goods has its finger in a couple of different pies and manufactures blood pressure monitors under the Balance banner. In the past, Balance has been the subject of much criticism due to the underperformance and lack of features of its blood pressure monitors. Recently, however, the brand has really upped its game and has put out some of the finest blood pressure devices of recent memory. Balance monitors also tend to be backed by significant warranties, so you will almost certainly be covered should something go wrong. Panasonic is one of the most famous brands in the world. It is ironic, then, that the majority of people do not realize it is in the business of manufacturing blood pressure monitors. Panasonic is internationally recognized for its video cameras, televisions, and sound systems; all of which are of an incredibly high quality. In recent years, Panasonic has utilized its expert design team to produce a series of blood pressure monitors to rival the likes of the devices produced by brands such as Omron, which has arguably a better reputation when it comes to the production of medical tools. Panasonic blood pressure monitors are usually incredibly intricate, feature-rich devices. Some people perceive them to be innovative and groundbreaking, while others view them as needlessly complicated and high-tech for the sake of high-tech. If you are looking for a straightforward means of monitoring your blood pressure, Panasonic probably isn’t the brand for you, but it is the perfect choice for the technophile suffering from hypertension. Okay, so we’ve covered the various different types of blood pressure monitor and some of the brands which manufacture them. Now we can move on to the monitors themselves. 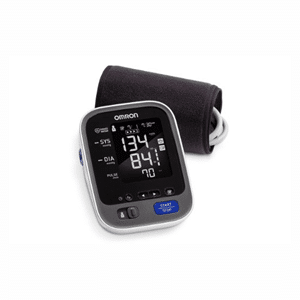 In order to save you countless hours of scrolling through webpage after webpage in an attempt to find the best home blood pressure monitor for you, we have gathered ten of the very best for this article. We will look at five of the most popular in detail, and then include links to the remaining five for you to research in your own time. Three out of the top five are upper arm monitors with cuffs, and the other two are wrist machines. Whichever you choose, high accuracy measurements are right around the corner. 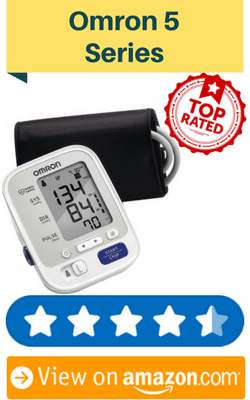 It seems only right to begin this list of the top blood pressure monitors with a product from Omron, which, as we already covered, is the number one doctor recommended brand of blood pressure monitor in the world. 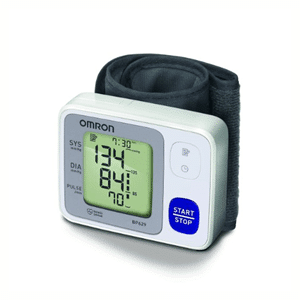 The Omron 5 Series is an upper arm blood pressure monitor and, despite recent releases, remains one of Omron’s most popular devices. It is considered to be one of the best automatic blood pressure monitors ever released and features Omron’s advanced accuracy technology, which means it takes three readings in ten minutes before combining the results to give you your average blood pressure level. This allows you to get a more accurate estimation of your blood pressure, which you can then store using the device’s superior memory system. The Wide-Range D-Ring contoured cuff size comfortably fits arms from 9-17 inches in circumference. The Omron 5 Series also has the ability to pick up on an irregular heartbeat. Should it find something amiss while reading your blood pressure, the monitor will alert you to it so you can seek medical help as soon as possible. Eyeing on the Omron 3 Series? We've made a review just for you! I mentioned earlier that Panasonic has been behind some of the most innovative blood pressure monitors of recent memory and the Panasonic EW3109 is the perfect example of that. This is not just the first portable upper arm blood pressure monitor Panasonic has ever produced, but the first full stop one. It provides the perfect solution for those who must monitor their blood pressure while on the move but don’t want to risk an inaccurate reading by using a smaller device such as a finger blood pressure monitor. 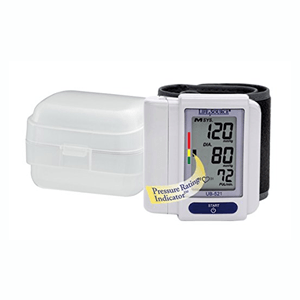 To ensure as accurate a blood pressure reading as possible, the EW3109W features digital filter technology, which isolates the sound of the pulse while taking your BP levels. This means you don’t have to worry about your results being thrown off by outside noises, which is a common cause of ﻿inaccurate BP readings﻿. 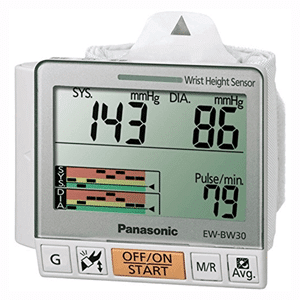 The Panasonic EW3109W also boasts one of the finest storage systems of any blood pressure monitor on the market and has an automatic memory which can hold up to 90 readings at one time, allowing you to track the spikes and dips in your blood pressure levels for months. The extra large blood pressure cuff fits arms up to 17 inches. For those who don’t want the hassle of setting up a blood pressure monitor every time they have to take their BP level, a wrist blood pressure monitor is generally the best way to go. They offer the far too rarely seen combination of accuracy and convenience, particularly if you get one from a trustworthy brand such as Balance. The Balance Wrist BP monitor is among the most popular BP devices on the market today and boasts a number of features to give you the most enjoyable using experience possible. It will take your blood pressure in minutes before presenting your results on its oversized LCD display, which can be easily read even in low lighting. 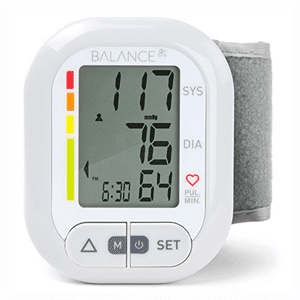 Despite its impressive performance, the Balance BP Monitor is one of the more affordable products on this list and can be purchased for less than $20. A lot of people will assume that the low price means the monitor is prone to malfunction, which is incorrect. However, if you should experience some sort of problem with your device, you have Balance’s two-year warranty to fall back on. If there is one manufacturer of blood pressure monitors that can rival Panasonic when it comes to game changing, groundbreaking releases, it is Omron. 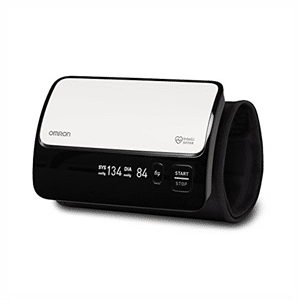 The O﻿﻿mr﻿﻿on 10 Series review is one of the most innovative blood pressure monitors we have ever seen and is one of the first of its kind. A wireless blood pressure monitor, it eliminates the need for awkward fumbling with tubes and pipes when trying to get an accurate reading. You simply slap on the cuff - which fits a standard adult arm - and you’re good to go. As well as being wireless, the Omron 10 Series has arguably the best memory of any blood pressure monitor on the market today. The device itself has the ability to store 100 readings at a time, which is almost unheard of. However, it doesn’t end there. This device is compatible with Omron’s free iOS and Android app, which allows you to store infinite blood pressure readings. Of course, the various extraordinary features of this monitor means it comes with a pretty hefty price tag, but those who must record their blood pressure on a daily or weekly basis should definitely consider investing in the Omron 10 Series Wireless. Looking for a manual model? You might want to check out our review on the ﻿ ﻿Omron HEM-432﻿C! Despite being one of the more simple devices featured on this list, the UB-521 deserves to mentioned in any discussion of the best digital blood pressure monitors. While it is often described as being “minimal”, it is important to remember that minimal isn’t such a bad thing. While the majority of people in the world are technologically sound, there is still a percentage of the population that struggles to comprehend modern technology. Those people have to check their blood pressure too. The LifeSource UB-521 is the perfect blood pressure monitor for older patients who struggle with navigating the various modes and features of more modern, occasionally obnoxious, devices. It features one-button operation, so even the least technologically inclined person can attain an accurate estimation of his or her blood pressure. While it is not as feature-rich as some of its competitors, the LifeSource has the ability to detect an irregular heartbeat. It also has a 90 reading memory, which is almost unheard of from a device this compact. Many people suffer from ongoing hypertension and must keep track of their blood pressure levels and heart rate every day. Others, however, are only advised to monitor their levels for short periods of time, with some people checking their blood pressure levels as rarely as once every couple of months. If you fall into the former category, it is a good idea to purchase a top of the range monitor from a brand such as Omron or Panasonic. However, those who do not need to check their blood pressure all that often can get away with buying a $20 blood pressure monitor providing they buy it from a trusted name with a proven record of quality. Although the vast majority of medical professionals would advise against using a home blood pressure monitor as a replacement for in-house checkups, most would also approve of using a home monitor in conjunction with regular visits to a doctor. Before deciding on which BP monitor will meet your needs, you should meet with a doctor or other medical professional for guidance. Looking for the best monitors for pediatricians? Check out our recent review. If a particular monitor on this list has stood out to you and seems like it may be what you’re looking for, we encourage you to delve deeper and carry out a little more research on it before making your final decision. You will want to ensure the one you choose has high accuracy. As well as consulting a doctor as we mentioned in the previous entry, check out some other home blood pressure monitor reviews to see what other customers thought of the product. For example, the below video from YouTuber MegaSafetyFirst provides an in-depth unboxing of the Omron 5 Series. And with that, we have covered just about everything there is to cover about blood pressure monitors. 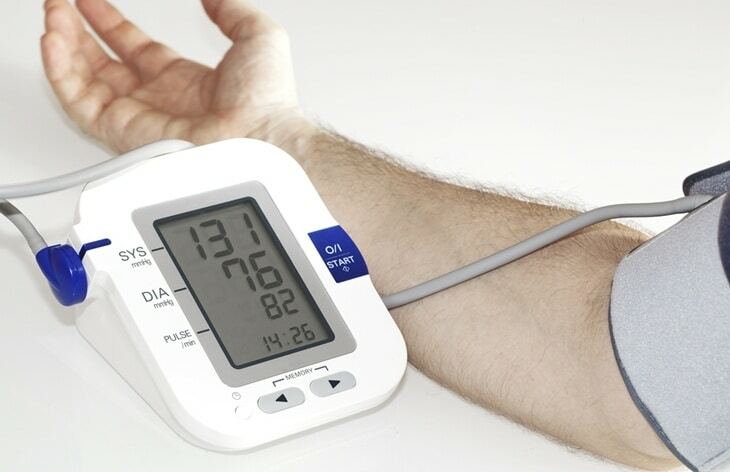 We have looked at the various types of monitors available, a few of the manufacturers in business today, and, of course, the very best blood pressure monitors. We have even included a few pointers to keep you on track when it comes to deciding which automatic BP monitor you want to spend your hard earned money on. Still on the hunt for more brands? 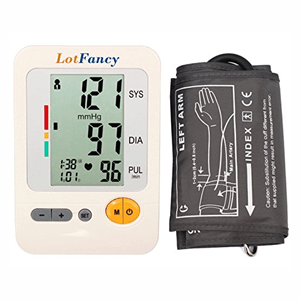 Check out our separate review on the best LotFancy blood pressure monitors and Withings blood pressure monitor to help your search! Regardless of what you choose, regularly using a BP monitor at home is a great first step to avoiding or reversing hypertension as well as a monitoring an unhealthy heart rate or pulse. We’ve done all we can do, you’re on your own now. But don’t worry! If you’re still undecided on which digital BP monitor is right for you, you will find a number of brand and product specific articles here on our site. Happy (and healthy) shopping!